Setting up a budget is an essential part of financial planning, no matter where you are in life. How you choose to create your budget is up to you, and there are many options these days. Software (i.e., Quicken) and mobile apps (i.e., Mint) can help keep track of your money or you can go with good old-fashioned paper and pencil. We’ve created a simple and inclusive worksheet at the bottom of this entry to help you get started. Start by identifying your monthly income. This includes paychecks, legal settlements, alimony, royalties, fees, and dividends from investments. Knowing your total monthly income is essential to making sure you don’t spend more than you earn. Next, figure out where your money goes. A helpful way to do that is to track your spending for one month: track your bills and keep receipts (for everything, even that soda from the corner store!). No bill or expenditure is too small to keep track of at this stage. 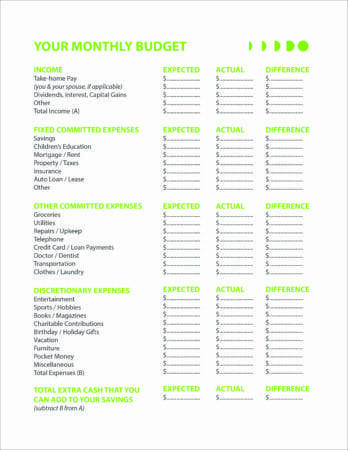 Once you know where your monthly income is going, you’re ready to analyze your expenses. You probably can’t do much to change your Fixed Committed Expenses like rent, so look at your Other Committed Expenses first; particularly the things you like but don’t need. Typically, this is the easiest place to economize. Eating fewer meals out, canceling that digital service you don’t use much, or brewing your own coffee instead of getting that fancy mocha latte are all great ways to reduce your spending in this area. After reducing your spending, look at the things you DO need. Can you reduce your grocery bill by clipping coupons, buying store brands, or shopping the sales at more than one store? Credit card debt is another area you should pay close attention to. A high balance can keep you from saving. A couple of ways to reduce that monthly credit card expense are to call your credit card company and ask them for an interest-rate reduction or transfer the balance to a card with a lower rate. Be careful to know ahead of time which of these actions will affect your credit score and how. For instance, if you have already applied for credit several times in the past few months, a new credit card inquiry could lower your score. Loans that could offer a tax deduction such as a home equity loan or a debt consolidation loan are other options for dealing with credit card debt. Be sure you can afford the monthly payments before you take the loan, however. Missing payments can cause you a lot of financial headaches. Remember to ask questions and read the fine print, and walk away from any lender who uses pressure tactics or won’t answer your questions clearly and promptly. If you need additional help with managing debt, The National Foundation for Credit Counseling can be a great resource for advice on how to negotiate payment schedules, etc. Visit the Federal Trade Commission’s website for more advice on how to find a credit counselor or manage debt. Once you’ve figured out where to economize, you can enter amounts in the Expected column of the budget. Notice that Savings and Children’s Education appear under Fixed Committed Expenses. This is to encourage you to pay yourself first, a key rule of saving. By setting aside a certain amount each month for savings, you can build toward your goal without missing the money. You may be able to set up a payroll savings plan through your credit union or bank. Also look into any employer-sponsored retirement plans you may have at work, which potentially offer tax benefits along with savings for the future. Set some savings goals for yourself; short-term and long-term. Studies show that people with savings goals tend to save more money than those that do not. STEP 5: Keep it Going! Your budget is a living document. Nothing is set in stone. As your circumstances change, so will your goals and needs. Review your budget regularly to make sure it’s working for you. Websites like practicalmoneyskills.com and mappingyourfuture.org and other similar sites offer loads of advice, tips, and calculators for learning how to use your money wisely. Almost everything you need or want in life requires money, so don’t skimp on your efforts to develop good money habits! If you work at it, we’re sure you’ll be glad later that you did—when your financial discipline has opened opportunities you wouldn’t have had if you’d spent freely.